Apple may be stacking its chips with a smaller SIM. Evidence of an ever-shrinking iPhone 5 just keep popping up. TechRadar reported in July that stockpiles of nanoSIM chips – a chip 40 percent smaller than microSIM – were being accumulated by mobile operators in anticipation of the phone supporting the new technology. 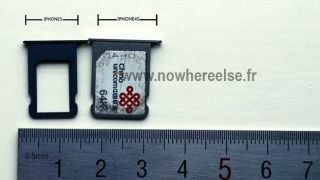 Photos that surfaced Monday seem to support the operators' suspicions and then some, reportedly showing a side-by-side comparison of nanoSIM chips and ejectable drawers found in the iPhone 4S and those supposedly coming to the iPhone 5. The photos reveal a narrower SIM slot and a retooled insert for the new smartphone, expected to be revealed during a September 12 event. Operators were caught off guard when the iPhone 4S sported a nanoSIM and they appear to be leaving nothing to chance this time around by loading up on nanos. The photos come just hours after TechRadar reported Apple will likely ditch its standard 30-pin port on all its iOS devices in favor of an eight-pin port, including the iPhone 5. Could the miniaturizing of Apple's line point to the inevitability of smaller devices, like the iPad Mini?